Congolese striker Rudy Guelord Bhebey Ndey is in intensive care after falling on his head during a match. The 25-year-old AC Leopards captain was hurt in the 17th minute of his side's Confederation Cup Group B match against Egypt's Zamalek on Saturday. He was taken to the Air Force Specialized Hospital in Cairo and arrived "in a very bad condition". On Tuesday, Dr Salah Abdelkhaleq said the player was doing better but it was too early to say if he will play again. "He had serious damage to his spinal column between the fifth and sixth vertebrae, a blow to the spinal cord, breathing difficulties and brain bleeding, but the surgery was successful," the doctor said. "The latest is that respiration is now stable after instability respiration on Monday. Chest muscles have been affected because of bruises in the cervical spinal cord. "His blood pressure has stabilised, and the player is conscious and recognises people around him. "As the main problem is the bruise in the spinal cord, we can judge the case after he get days of rest and medical follow-up." Ndey was visited on Monday by the Confederation of African Football's medical manager Boubakary Sidik, who said: "Ndey is receiving the necessary medical care for such a situation in excellent conditions. "The (hospital) personnel have been very supportive and professional in their approach, giving him all the attention and care needed. 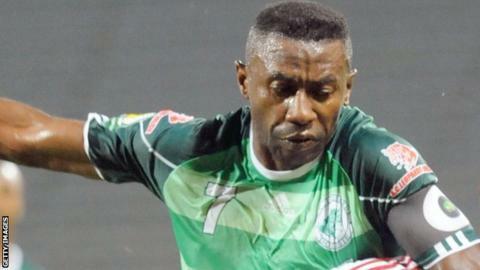 "Both teams (Zamalek and AC Leopards) are working hand-in-hand to get him back to his best." Ndey suffered the injury when he fell awkwardly while trying to avoid a collision with Zamalek goalkeeper Ahmed El-Shenawy. An official from Zamalek, who won the match 2-0 in Cairo, said his club would pay the medical expenses. In a show of support, Zamalek captain Hazem Emam and some of his team-mates visited Ndey at the hospital. Ndey led Leopards to Confederation Cup glory in 2012, beating Djoliba of Mali 4-3 on aggregate in the final. He was also named in the Congo squad for their 2014 African Nations Championship in South Africa.